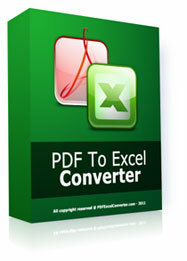 PDF To Excel Converter is a useful software that helps users convert PDF file to Excel. It's good for people who work in office, move file from PDF to Excel will be easy to edit. The developer claims this converter is faster than other similar software. Normal retail price is $39.99 US dollars. Now, we have the chance to grab it for free. Just go to this page, download software and write down serials code: QBLX63E875PLS81. NOTE: This giveaway has been closed on March 1st, 2012.